The Rosalind Franklin Appathon Prize and Tech day: A celebration of pioneering women in STEMM past, present and future. Last week Angela Attwood and I attended the Rosalind Franklin Appathon Prize and Tech day. The appathon was set up by UCL Professor Rachel McKendry with funds from her Royal Society Rosalind Franklin Award. The Rosalind Franklin Award recognises outstanding women in science with an idea for how to raise the profile of other women in their field. Professor McKendry’s idea was to hold an appathon with two challenges. The first challenge was to invent an app that would empower women to become leaders in STEMM (science, technology engineering, mathematics and medicine). The second challenge was to recognise a woman who had pioneered a new app for research, societal good or enterprise. Marcus had nominated me for the second challenge for my work developing the iPad app About Face for teaching emotion recognition to children with autism. Although I was not short listed in the end, I was pleased to be invited along to the prize and tech day to celebrate the winners and their apps. On the day we were shown videos showcasing the shortlisted apps, some of which you can see here. The winner of Challenge 1 was Amazing STEMM Trailblazers an app for teaching children about influential women in STEMM through games. The runner up was STEMM Role Models, an app for finding female experts to speak at conferences. My personal favourite in this category was EyeSTEMM an app which suggests STEMM careers for young users based on photos they upload to show their interests. There were many exceptional apps shortlisted for Challenge 2, all of which would have been worthy winners. 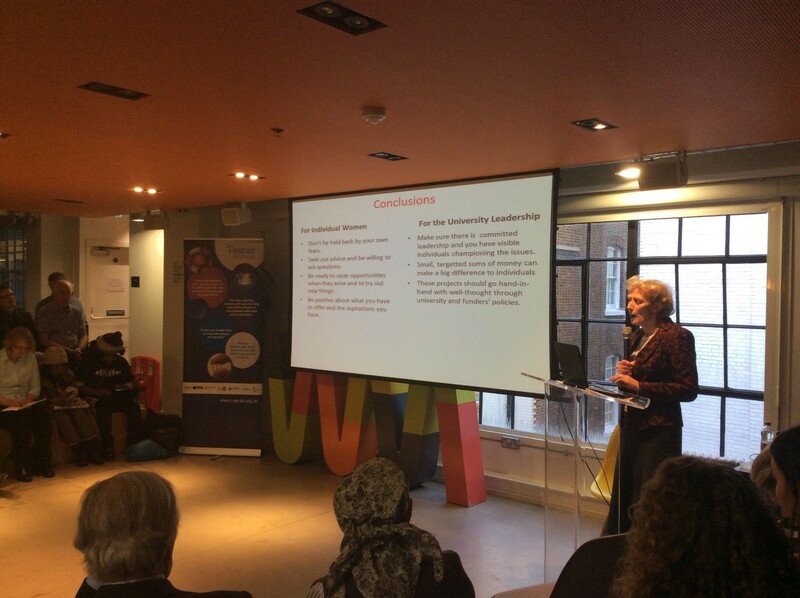 The winner was eSexual Health Clinic, developed by epidemiologist Pam Sonnenberg and her team at UCL. It provides Chlamydia test results and after care, including ordering antibiotic medication to the users local community pharmacy. This app demonstrates the potential of mobile technology to revolutionise health care and reduce strain on the NHS. The runner up was Findme developed by psychologist Sue Fletcher-Watson from Edinburgh University. The app aims to teach children with autism social skills such as following eye gaze and gestures. It was created with consultation with individuals with autism, and the effectiveness of the app has been tested in a randomised control trial. Also shortlisted was Drink Less, which may be of particular interest to readers of this blog. This app was developed by Professor Susan Michie and her team of health psychology researchers at UCL. The app aims to help people keep track of, and to cut down on, their alcohol intake. The data from this app is being used to test how well particular techniques for cutting down work when delivered in an app, rather than by a clinician. Professor Dame Athene Donald speaking about how to promote women to become leaders in science research. As well announcing the winning apps, the afternoon also included a number of brilliant talks addressing the challenges and opportunities for women in STEMM industries today. Speakers included Jennifer Glynn, Rosalind Franklin’s sister, who spoke of male-only common rooms in universities which were the norm in the 1950s, reminding us of how far we have come in terms of gender equality in academia. Baroness Martha Lane Fox, founder of lastminute.com, spoke about gender imbalance in the technology industry (only 17% of tech jobs in the UK are held by women) and emphasised the importance of encouraging women to consider STEMM jobs in order to address skills shortages. Finally, Professor Dame Athene Donald gave an inspirational talk about her experiences as a leading female physicist and her ideas for how to promote women in science. This talk I found particularly interesting as a woman seeking a career in this field. The whole day was very inspiring, both in terms of showing the potential of technology to make positive differences in research, health and education and in terms of showcasing the many women who are playing a leading role in this field. Although there are clearly still challenges being faced by women in STEMM, the message of the day was one of confidence that these can be overcome.